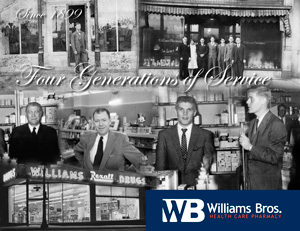 Williams Bros. Health Care Pharmacy was established in 1988 by brothers Charles, Mark, and Jeff Williams. The brothers wanted to revive a modern day version of the original pharmacy business established by their great-grandfather, Charles C. Williams, in 1899 and continued through their grandfather, Joe, and father, Paul. 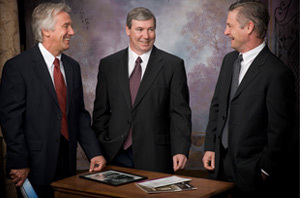 The brothers initially began a local retail pharmacy and home medical equipment company in 1988. In 1990 they expanded to provide home infusion, and in 1995, a long-term care pharmacy division was added to complete the company health care services. Nearly 500 employees share our mission and vision to help achieve our goals. Williams Bros. provides a full array of patient care services by providing retail pharmacy, compounding pharmacy, infusion therapy, home medical equipment, respiratory, aging in place, and long-term care pharmacy. Contact us online or visit the Williams Bros. Health Care Pharmacy in your area to learn more about our services.